Bulb is the common name for the hard and brown logged trees that dot the Aanthirin's landscape. Bulb trees have spirally arranged colorful leaves with smooth margins, and most of the leaves are colored green, orange and yellow. Most of these trees are found in the plains of Aanthirin, but you can also encounter them in the yellow canyons of Thirr Valley down south. While not possessing any worthwhile alchemical properties, these bright shoots grow fast and spread quickly along the Thirr, and are a familiar sight to any who traverse it. These red lilies grow along most of the Thirr, and foreigners visiting Morrowind often mistake their orange lilypads for fallen autumnal leaves. The leaves themselves have no alchemical benefit, but the blossoms are useful to swimmers, allowing them to dive longer and more swiftly, undisturbed by the chill of the water or the attention of its less pleasant inhabitants. 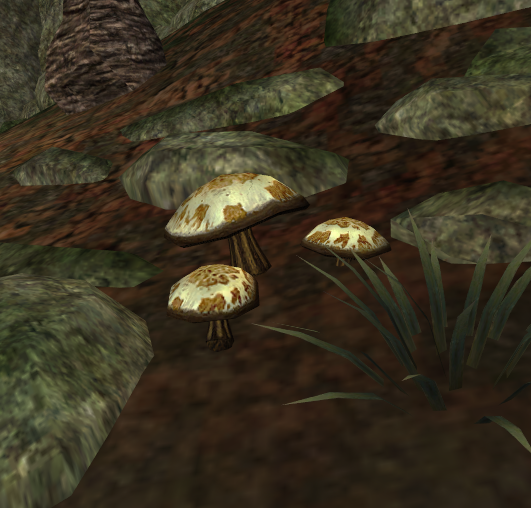 Moss clumps are common in shady and moist areas across the Mainland Morrowind. Both the soft fronds and the dry pods are alchemically active, though the pods are far more valuable. The orange variation of the moss is found on Aanthirin. Named for their resemblance to the orange domes of Dunmer temples, Temple Domes are ubiquitous in Aanthirin. While eating them can cause temporary weakness of vision and slothfulness, alchemists harvest them for their protective effects. Often likened to drops of lava or flame due to their striking appearance, locals of the Aanthirin have many stories about the origins of these mushrooms, often associating them with pilgrims. Eating them leads to light-headedness and nausea. Domesticated Velk are frequently kept in the Indoril half of the region. They are peaceful animals, protected by Indoril law, and their trade is heavily regulated. With their long tongues, they drink nectar from flowers, which can then be extracted from their livers. The brewers of Vhul use the nectar to brew punavit, the sacred liquor of House Indoril. The high nobility uses it in their rituals to communicate with their long-dead ancestors. Yeth-Grubs are flying scarabs found along the Thirr River. They feed off the mushroom tables and the tops of the mangrove mushrooms along the river, as well as the remains of similarly sized creatures. They're attracted to the smell of rotting flesh, so they are known to swarm around carcasses under the heat of the sun. Their exoskeletons are notable for looking like a mask, used to frighten off would be predators. The bull netch is a huge beast that hovers in the air, supported by internal sacks of magical vapors. The bull netch is poisonous. The betty netch is a large hovering beast, supported by internal sacks of magical vapors. The betty netch, the female of the species is smaller than the bull netch, but fiercely territorial. The guar is the dominant domesticated herd animal of Morrowind, useful as a pack animal and for its meats and hides. Some guar, homewer, remain feral and aggressive. Mudcrabs are small creatures with a hard shell. They live mostly among the coast, and they are usually not aggressive. But they become hunters if they ever get the taste of meat. The rat is a hardy, abundant hunter-scavenger, found on the land surface and in natural and excavated underground environments.